Well, we found three locations in just three days in Calgary, and they were all pretty awesome. But the Calgary Central Library was truly incredible. Let’s talk about each of these locations in chronological order of our visits. The 3-year-old girl jumps from shape to shape, while a 4-year-old boy talks loudly about his block creation. Young ladies dressed in YMCA sweaters watch over the kids, playing with them but not shushing them as most would at a library. Here in the children’s area of the small Quarry Park Branch, it’s expected that kids will be kids. 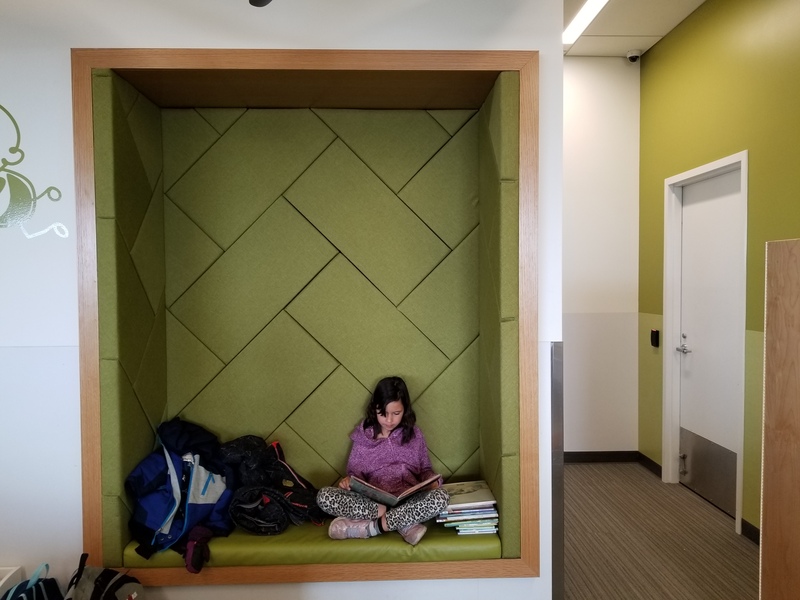 K-girl finds a reading nook and brings over a pile of books, which she eagerly reads. She leaves the nook off and on to get more books, and the pile keeps on growing. She’s in her happy place. I’m so very happy that she’s so fond of reading, and that I was able to teach her to read when she was ready. 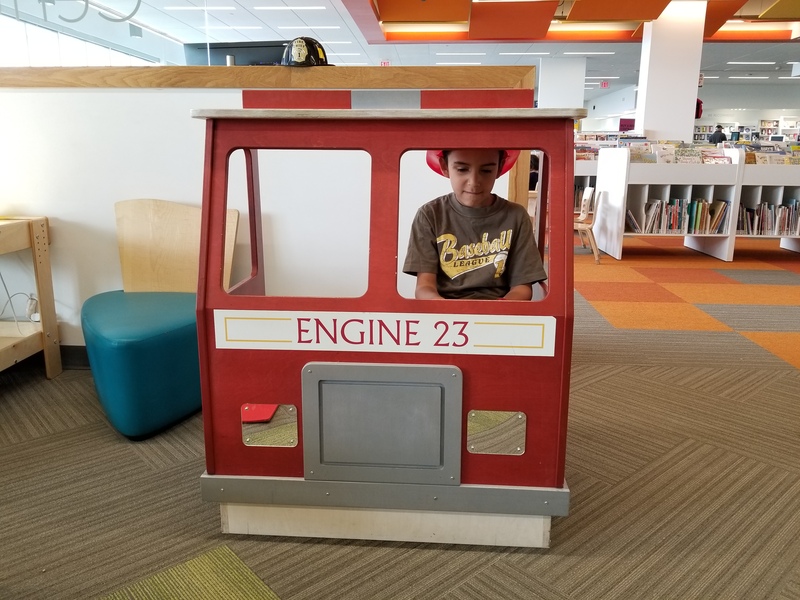 Learning to read is coming slower for the younger two, but we continue to foster a love of reading by telling stories, reading to them, and of course, visiting as many libraries as possible. Of course, learning for young children doesn’t just come from reading or having stories read to them. Playing, as many people seem to have said (but maybe didn’t), is children’s work. While this saying could be debated, as the link I just pointed to does, I watch my children play and I watch them learn through their play every day. Especially when I leave them alone and don’t interfere too much, I can actually see them learning. This is true for both motor as well as social skills. Young children learn a lot by simply playing and exploring their surroundings. 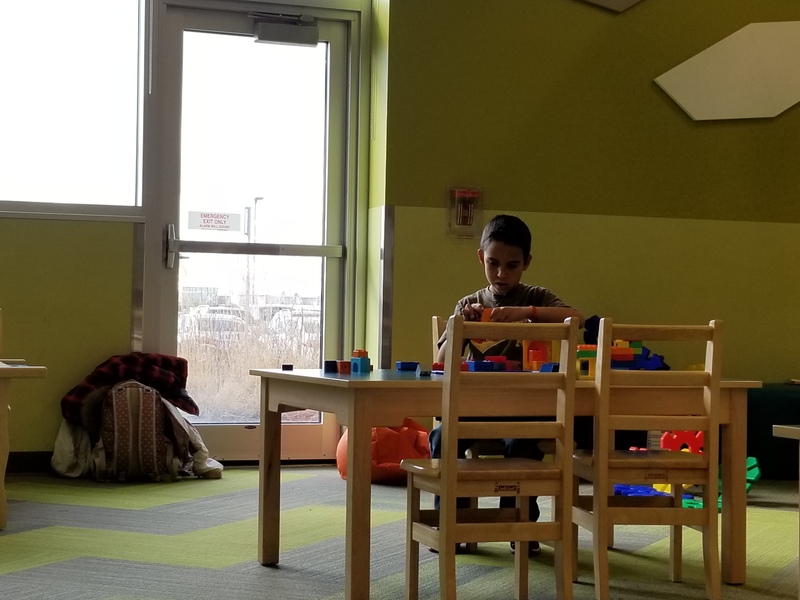 The Quarry Park Library fosters this type of learning well, with several tables with activities ready for children to enjoy. Blocks, crayons and paper, links, magnetic letters on a large board, plus stacking rings for the younger ones, all invite children to learn through play and to have fun. A very neat service offered in the children’s section of this library are themed learning packs, which come in little suitcases on wheels that are in fun shapes. There is a dinosaur learning pack which includes children’s books about dinosaurs, dinosaur toys, and index cards about different types of these ancient animals. The farm animal pack has books on the theme, plus wooden blocks for playing with, and a little looking glass that shows how a fly sees the world. There’s a nature themed suitcase, and more. If you have a library card, you can sign these out for three weeks, and I think they’d make great additions to a homeschooling unit on the themes. After going through some of the material in these packs and reading several books, M-girl is ready to do some more playing. 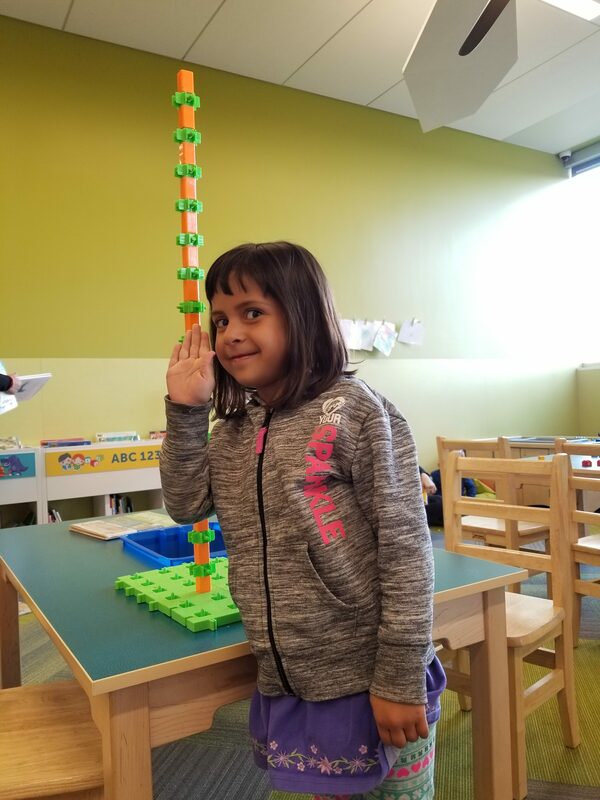 I leave her to her play for a bit, and a few minutes later, she’s very proud of her giant tower, and wants me to take a photo, so I do. We spend quite a bit of time at this small branch of the Calgary Public Library, as Dan has to do a repair on the RV. While he makes the repair, the kids and I enjoy books and toys at Quarry Park. Our toilet’s flush pedals broke off, and unfortunately they’re not really something you can replace. So first thing the morning after this happened, we called Canadian Leisure RV in Calgary to ask if they had RV toilets available. They did, so Dan dropped us off at the library, then went to the store to buy the new toilet and install it. After he was finished, he came to pick us up, and we went over to Dan’s cousins house for a great visit. The day after our first visit with Dan’s cousin and her family, we had to take care of some logistics. We got K-girls teeth looked after, I got my prescriptions filled, and we got some laundry done. With the little time that was left before we had to head back to Dan’s cousin’s house, we checked out a library near her house. The children run and climb while a couple of meetings are taking place nearby. 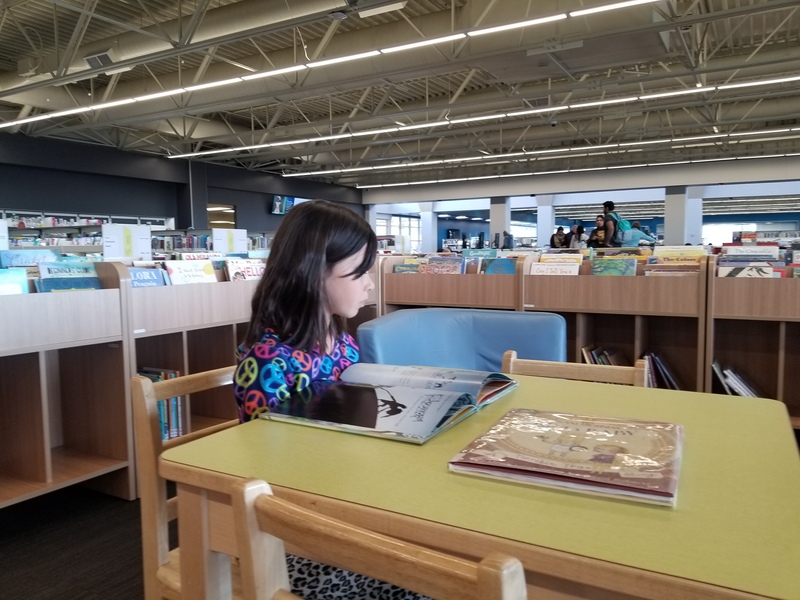 K-girl goes in search of more books to read, and she’s brave enough to independently ask the librarian to help her look for a book. We’ve visited so many libraries now that K-girl is at ease at most of the ones we visit, and she knows who to ask for help when she needs it. 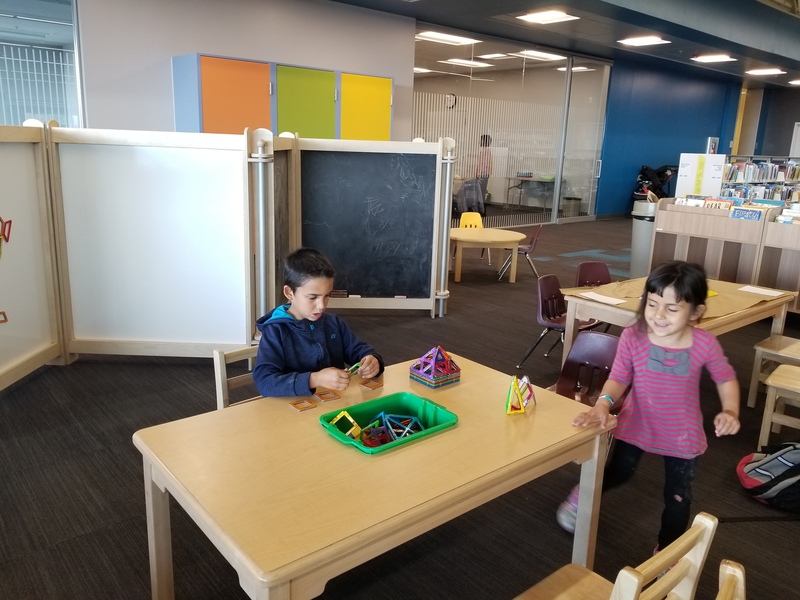 Just like at the Quarry Park branch, there are several activities for children to choose from, at tables spread throughout the large children’s area of the library. They can do rubbings, stack blocks, play with magnets, write with chalk, play with trains, and more. And of course, there are several books to choose from. The Crowfoot branch is lovely, but alas, our visit is short. We want to get to Petra’s house in time to cook dinner for everyone on our second visit to her home. Among protests of “I don’t want to leave,” we remind the kids that they get to play with their cousins again when we get there, and they seem a little less upset once they hear that reminder. 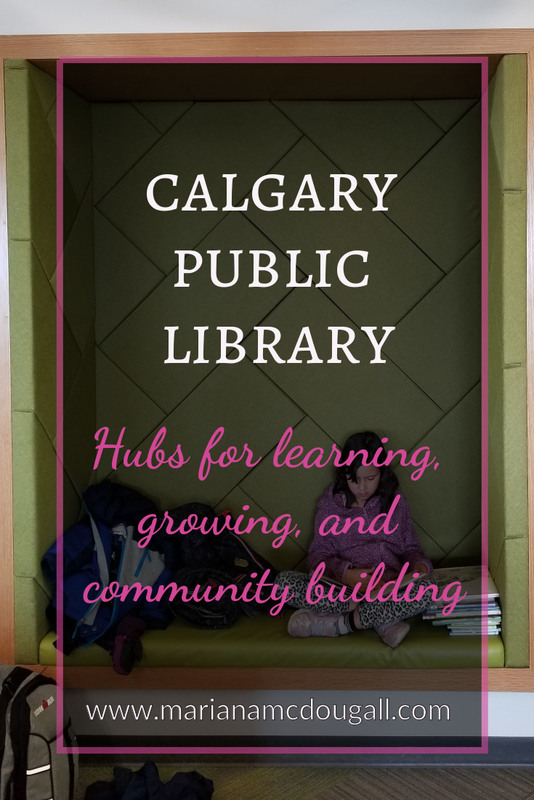 While we visited three locations, the Calgary Public Library has a total of 21 branches. You’d have to spend a lot of time in Calgary to visit all of them, and I think a mini-vacation in Calgary to check all of these branches out would be totally worth it. 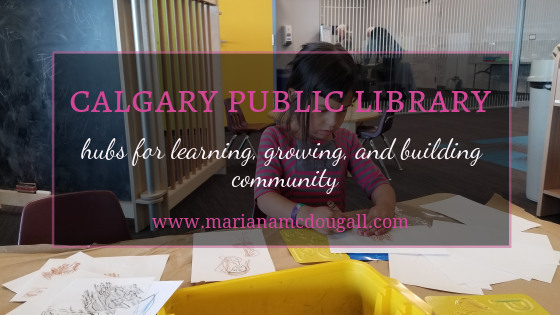 Of course, there are many other things to do in Calgary and area, but we were mostly interested in visiting family and having some downtime, so visiting the library, while not an exciting outing for some, was just right for us. 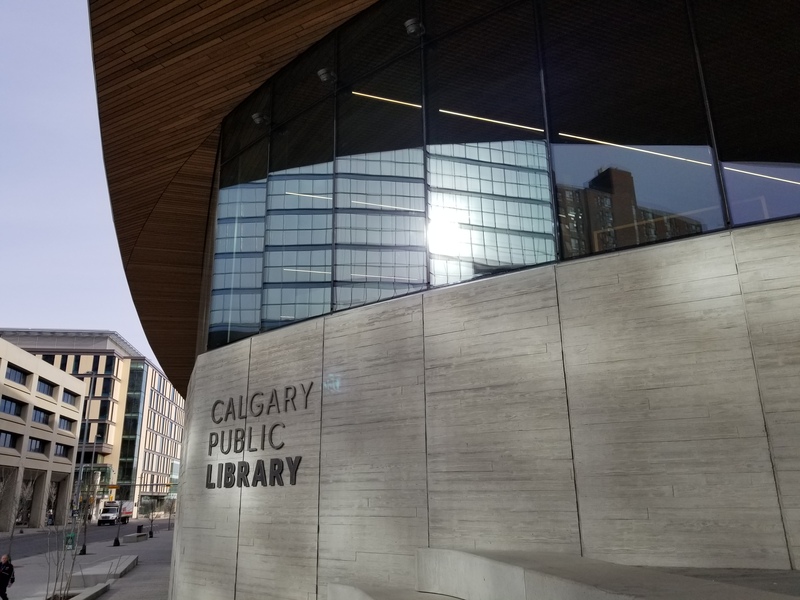 And even if you’re not a library lover like us, you’ll still enjoy an outing to the Central branch if you like history, architecture, and/or art. This library is so amazing that it deserves its own post, so stay tuned for that! What is the best library you’ve ever visited?.